Salzberg, Sharon. Lovingkindness: The Revolutionary Art of Happiness (Boston: Shambhala, 1995). This inspiring book by a cofounder of the Insight Meditation Society in Barre, MA, introduces the West to the practice of metta, or lovingkindness, practice. Salzberg, Sharon. 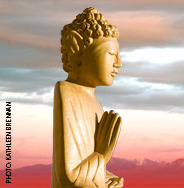 A Heart as Wide as the World: Living with Mindfulness, Wisdom, and Compassion (Boston: Shambhala, 1997). Stories, anecdotes, and brief teachings that show how to live this spiritual practice in the everyday world, by a cofounder of the Insight Meditation Society in Barre, MA. Salzberg, Sharon, ed. Voices of Insight (Boston: Shambhala, 1999). A rich anthology of writings by teachers who lead retreats at the Insight Meditation Society, in Barre, MA.